Lectures, lessons and seminars: words and phrases for talking about studying (2). As promised last time, this post continues the theme of study, and once again there are many differences between British and American English. In the UK, the school year is divided into three periods, called terms. In the US, the school year can be divided into two periods, called semesters, or three periods, called trimesters. Many US universities have summer periods, so their year is divided into quarters. Students have a timetable (UK)/schedule (US) to tell them the times of their classes. To talk about what is taught in a particular subject area, we use the words syllabus or curriculum. The person in charge of a school is called the headteacher in UK English and the principal in US English. I attended several of her lectures. 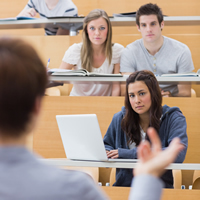 A person who teaches at a college or university is called a lecturer in the UK and a teacher or a professor in the US. In the UK, the title Professor is only used for the most senior lecturers. If you study a subject such as history or literature, you will certainly have to write essays. In the UK, a longer piece of writing, often done as part of a college or university course, is a dissertation, while the written work for a PhD is a thesis. Confusingly, in the US it is the other way round – with US students writing a master’s thesis and a doctoral dissertation. When you do a piece of writing, you may start with a rough draft (a basic plan) and you may need to do some research to find the facts you need. Remember to use the verb do (not ‘write’ or ‘make’) with homework, and also that the word ‘homework’ is uncountable – don’t put ‘a’ in front of it or try to make it plural! Your teacher sets (UK)/assigns (US) your homework (tells you what to do), and you may have to hand it in (UK and US)/turn it in (US) (give it to the teacher) the next day. When your teacher is talking, you may make notes (write some things down) in a notebook so that you will remember what was said. You may use a textbook in class, with information about the subject you are studying. For subjects such as languages, you do exercises to practise what you are learning. For maths (UK)/math (US), you may need to show your workings (UK)/work (US) (write down how you reached the answer). Finally, if you have an exam or a test (a small exam taken in class), you will need to revise (UK)/review (US) what you have learned, to check that you can remember it. Thank you vrtu much for this useful thread. Thank you very much Liz. Your post is very useful. What a useful blog! Thank you very much for all these articles addressing such specific subject matters. I don’t live in either US or UK but I thought a master’s thesis was a final piece of work you hand in to end a cycle and get a degree (meaning something you do only once in a course) whereas a dissertation is something you’re set to do in the middle of any course and any subject matter (that is, several times during a course). Could you please further clarify this? Hi Fernando: When I did my own master’s degree, I wrote several essays and one long dissertation at the end. That was a long time ago now, but I believe the same terminology is still used in the UK. If anyone has more up-to-date experience, please let me know! These hints are all so easy and useful. Thanks a lot.